本公司为中国官方正式授权的签证办理机构,帮助有需求的人士办理三类中国签证：学生签证（X2 Visa), 商务签证（M Visa）和工作签证（Working Visa）。 Chinese visa application services are provided. 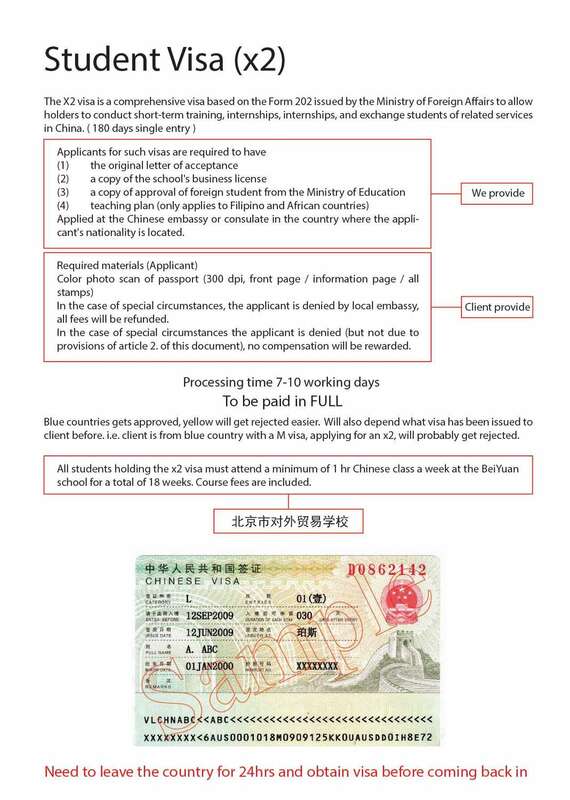 The Chinese visa has Student Visa (X2 Visa), Business Visa (M Visa) and Working Visa (Z Visa). One completed Visa Application Form with are recently-taken color passport photo (bare-head, full face) against a light background attached. If you are applying for a Chinese visa for the first time, you should provide your previous passport held and a photocopy of its data page. Student Visa X2 and Commercial Visa application doesn't need any paper materials. Applicants are only required to send materials scanned to our designated e-mail. 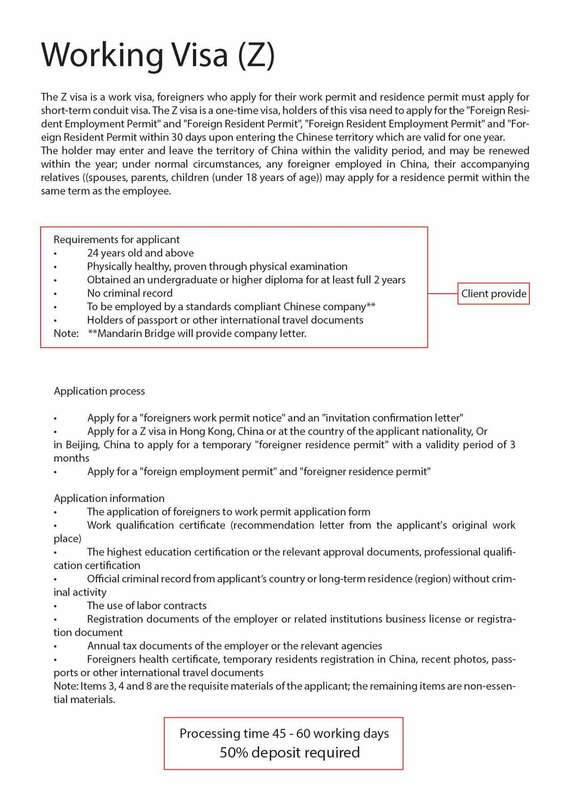 Applicant is required to achieve the non-criminal record certification with a blue authentication label issued by China embassy. Health Check. It can be issued by designated medical organization in China. PS: Applicants must be 24 years or older and have a bachelor's degree for at least two years. Proof of work is not necessary to be given. During the visa processing，the applicant may need to provide materials which are easily achievable such as a personal ID photos. 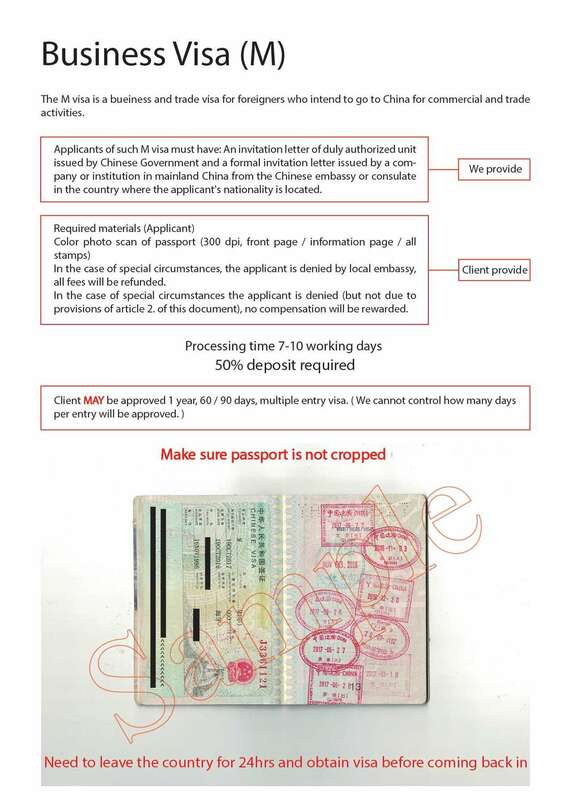 We will acquire the needed visa application materials in promised working days. We will take photos of the materials and send the pictures to applicants once we get them. Applicants will pay the rest of the service fee after they confirmed those photos. When we received the remittance, we can then mail the application materials out. Applicants could apply for a visa domestically or in Hong Kong （not available forall applicants） with the application materials. Clients applying for visas in their home country should go to the Chinese Embassy to conduct interviews. Clients applying for visas in Hong Kong need to go to the Hong Kong Office of The Commissioner of The Ministry of Foreign Affairs to conduct interviews. 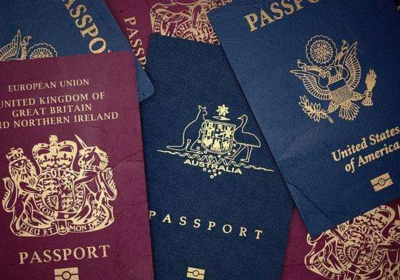 In 20 working days after the case is accepted, if there is no major notification, the applicant can be regarded asthe applicant is eligible for a work visa. Working visaincomplete, will be update once finished.